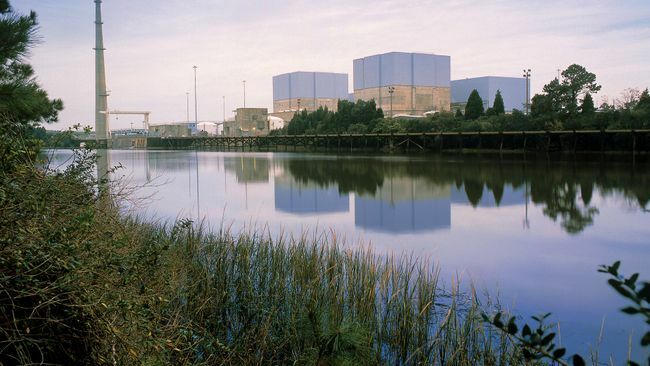 SOUTHPORT, N.C. – Duke Energy officials today shared data from key environmental programs that show the operation of Brunswick Nuclear Plant is environmentally sound. Duke Energy’s North Carolina president, David Fountain, praised the Brunswick plant for providing customers with more than 40 years of carbon-free electricity generation. According to Fountain, Duke Energy has reduced carbon emissions by 30 percent since 2005 and expects to increase that number to 40 percent by 2030. “If we are to meet our emissions reduction goals, nuclear energy must be part of the solution,” said Fountain, praising the plant for setting reliability records in 2016. “A smarter energy future for North Carolina begins with providing reliable, affordable and increasingly clean energy,” said Fountain. Brunswick site vice president, Randy Gideon, pointed to two key environmental programs at the plant that show not only that Brunswick is a dependable generation source, but also environmentally responsible. The biological monitoring program has been in place since 1968 and is one of the most in-depth biological studies in the United States. “Decades of data consistently show that plant operations have not had any significant impacts on the marine populations studied,” reported Gideon. Located adjacent to the Cape Fear River, the plant circulates water to cool the plant, which powers about 1 million homes and businesses is the area. Where the water is pulled from the river, a diversion structure is designed to keep large debris and marine organisms out of the canal. Nearly two miles from that point, the plant uses fine mesh screens to sort out smaller fish and shellfish. A large sluice system called the “slide for life” returns these screened-out fish back to the estuary. Recent improvements and capital investments have decreased the chances that sea turtles can get into the canal. If turtles get into the canal, plant employees remove them and return them to the ocean. A commissioned watercolor painting, by local artist Ricky Evans, was unveiled to commemorate this harmony of electricity generation with the company’s responsibility as environmental stewards. Duke Energy Progress owns nuclear, coal-fired, natural gas, renewables and hydroelectric generation. That diverse fuel mix provides about 12,900 megawatts of owned electric capacity to approximately 1.5 million customers in a 32,000-square-mile service area of North Carolina and South Carolina. Headquartered in Charlotte, N.C., Duke Energy is one of the largest energy holding companies in the United States. Its Electric Utilities and Infrastructure business unit serves approximately 7.5 million customers located in six states in the Southeast and Midwest. The company’s Gas Utilities and Infrastructure business unit distributes natural gas to approximately 1.6 million customers in the Carolinas, Ohio, Kentucky and Tennessee. Its Commercial Renewables business unit operates a growing renewable energy portfolio across the United States. Duke Energy is a Fortune 125 company traded on the New York Stock Exchange under the symbol DUK. More information about the company is available at duke-energy.com. The Duke Energy News Center serves as a multimedia resource for journalists and features news releases, helpful links, photos and videos. Hosted by Duke Energy, illumination is an online destination for stories about people, innovations, and community and environmental topics. It also offers glimpses into the past and insights into the future of energy.